This is a clickable button of how to access the Clergy Assistance Program's vast resources. These resources are designed to be helpful for you or your family personally or even to inform your future directions. *** A screen print of the C.A.P. Home screen is pictured above. 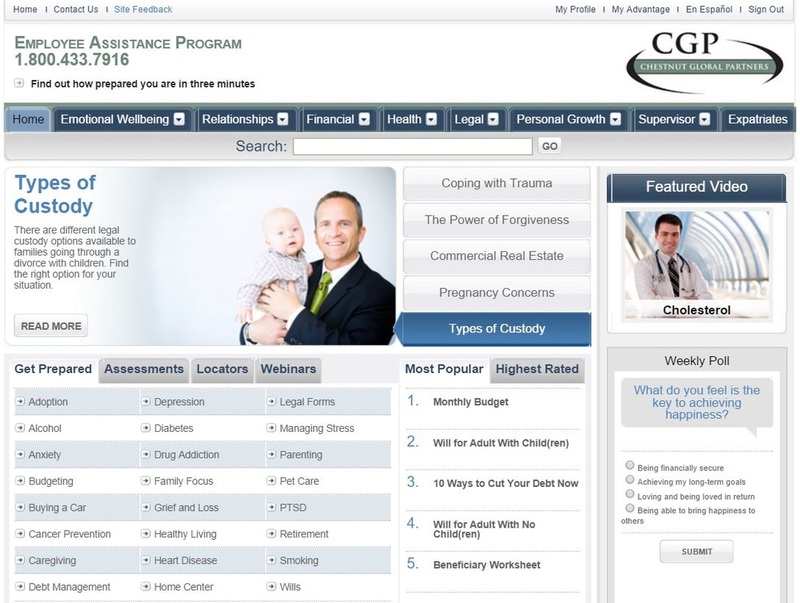 This will take you to the CAP Home screen where you have access to numerous resources on emotional wellbeing, relationships, financial, health, legal, personal growth, and supervisory resources. In addition, you have access to a wide range of topics including: coping with trauma, forgiveness, adoption, anxiety, depression, grief and loss, caregiving, cancer prevention, pet care, retirement, wills, debt management to name a few. There is a tab with Assessments that include: General Health Risk Assessment, Diabetes Risk, as well as Depression and Anxiety screenings. The Locations tab searches your geographic area (by city/state or zip code) for Adoption services, Adult Care Services, Child Care Services, New Parent Services, and Educational Services. Through the Webinars tab you can access free webinars on a variety of topics (Partner Communication, Family Systems and Communication, Goal Setting for Life, What colleges really look for) that you can either listen to or read via a PDF file. Life invariably brings stressors to all of us and the ministry brings its own special challenges. We are not called to face these issues alone. Healthy people go to counseling when they have an issue to work through. We are wise when we take advantage of the resources God offers to be as healthy and effective as we can be. IGRC's Office of Pastoral Care and Counseling has partnered with Chestnut Global Partners to provide clergy families with a broad network of support and local licensed counselors. Whatever challenges you're facing, the Clergy Assistance Program has someone who can help. We encourage you to take a look at the attached brochure and consider which resources might be helpful to you. CAP extends to clergy families and so we invite you to share these resources with your family. Have questions about CAP? Check out our list of Frequently Asked Questions.